Marks and Spencer is among the first brands to book the Langridge Stand, Bath Racecourse's new conference and events facility. 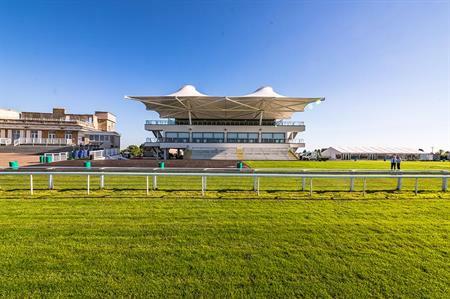 The Langridge Stand, which enjoys views across the city, officially opens today (20 July) for conference and events, as the racecourse aims to scale up its non-race day activity. The main space within the new stand, designed by D5 Architects, is the Royal Crescent Suite. This has capacity for up to 300 people in theatre-style seating and boasts a private roof garden overlooking the racecourse finishing line, which can be used as a breakout space. There are a further nine existing suites available for hire in the racecourse’s Kelston Hospitality Stand. Jo Hall, executive director of Bath Racecourse, said: "Whilst the [new] stand has been built to accommodate our racing business, there has been a real focus on delivering conferences and events, providing us with a great opportunity for us to grow non-race day business. Over the next three years we are looking to double the number of non-race day events, and with a clear focus in these key areas we believe this will be achievable." Racecourse owners Arena Racing Company funded the redevelopment.